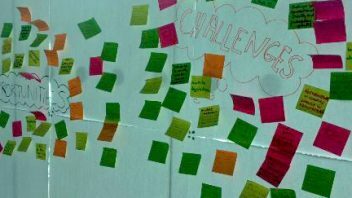 Home » News & Blogs » Community supported enterprise – how’s it going? Community supported enterprise – how’s it going? A year on from our first report back on the REconomy Project’s Community Enterprise Support and Investment (CESI) programme we have reasons to be pleased. Here’s what we’ve been up to the past year. 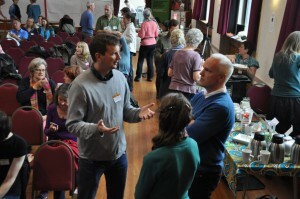 In Totnes, the project to support the emergence of an entrepreneurial eco-system and culture was already well underway by the time the CESI programme was launched. Projects like the Local Entrepreneur Forum and the REconomy Centre incubator were already nurturing the seeds of a new kind of local economy. What CESI offered was funding to support this ongoing work, to study the impacts on at least 10 Transition Enterprises, and to promote the models and practices that were getting results. This presented an opportunity to share our experience and support the Lambeth REconomy Project’s efforts to organise their first Local Entrepreneur Forum, and for us to amplify our own support efforts for a select group of programme participants. Over the past year, the synergistic relationship between the REconomy Centre and the Local Entrepreneur Forum (LEF) has continued to develop. The REconomy Centre provides a workplace and support for over 50 members that range from individuals pursuing their own livelihoods and entrepreneurs developing their start ups, including those who have participated in past LEFs. This year, three of the four local entrepreneurs pitching at the 4th annual LEF, were coached and mentored on business models and presentations. The LEF itself, run in May of this year, was another big success – 130+ people attended, 4 projects were pitched, thousands of pounds of financial and in-kind support were pledged, new collaborative relationships were begun. The REconomy Centre picked up a few new members, too, and a pipeline of projects is beginning to take shape. Pitching were Wild & Curious, KEVICC’s Underground Chocolate Cooperative, Dartmoor Pony Training Centre, and Green Funeral Company. Each were generously supported by the Community of Dragons with offers ranging from gifts of money, pre-purchased goods and services, free labour and promotion, architectural advice, professional services, and much more. That the LEF provides a sucessful model for connecting local entrepreneurs and local investors is clear. After four years, what is also becoming clear is growing sophistication and ambition arising from the events. This year, one of the big conversations generating serious interest is for the development of a regional bank – the Bank of Devon. Follow up meetings have already taken place, for example. And the local credit union, a participant in the first LEF in 2012, is now channelling some of that energy to increase its capacity and ultimately fill that role. 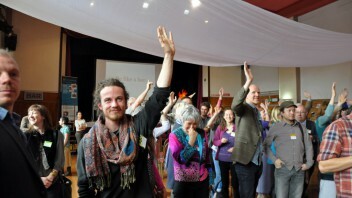 If the goal is to create a new kind of local economy, one that is inclusive, just, equitable, sustainable, accountable, resilient, and prosperous – a real alternative to the dominant and destructive corporate economy, then the strategy to bring this into being must create the conditions for new economic actors and relationships to emerge. Together, the LEF and the REconomy Centre provide such a strategic foundation and a platform for a variety of other projects and community engagement activities. Two recent developments in that regard are efforts to develop a local investor network and a community exchange system, or ‘social currency’. These efforts contribute to infrastructural supports for new or developing Transition Enterprises. We have 10 in the CESI programme for whom we’re providing a little extra support, where needed, and are tracking the results. What we’re learning so far is that meeting some of their needs through programmes like the REconomy Centre incubator and the LEF works and is very valuable. Providing one-on-one mentoring is also valuable and can be done with locally sourced expertise. More difficult is providing specific expert services for specific needs. Usually, but not always, these can be sourced from service providers in the market. But in the cases where the enterprise is really innovating, such as with Transition Homes, they’re ahead of the market and truly pioneering. In these cases, they are blazing a new trail, venturing forth beyond the capabilties of most professional support organisations, as well as our programme, to provide support. On the other hand, this example helps to identify a leading edge where future resources might be applied. 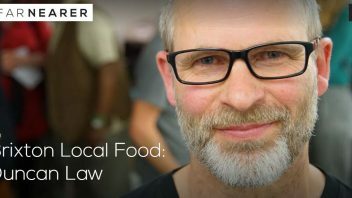 In Lambeth, the CESI programme put the Local Entrepreneur Forum model at the centre, around which a network of local entreprise support and 3rd party programmes would be woven. We were almost daunted by the richness of the local business support offerings and potential network contributors. We developed excellent supportive relationships with a number of local ones, notably Tree Shepherd, One Planet Ventures Hatch Incubator, and Create Lambeth and collated a compendium of other offers for start ups here. A number of our transition enterprises took advantage of their offerings. We had interest from a number of funders in this field such as UnLtd, City Bridge and practical help from The Funding Network who attended the Totnes LEF in 2014 and do charity fundraising at similar events. We joined the Impact Hub Brixton, a social enterprise co-working space and enterprises began to come towards us. We held a ‘launch event’ to announce the Local Entrepreneur Forum, called our Local Enterprise Uprise. 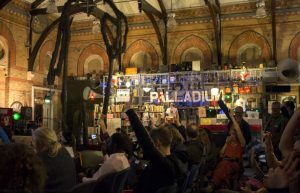 We had short presentations from the TTB enterprises, Brixton Pound, Brixton Energy (Repowering London), Remakery Brixton; our business development partners and a couple of other enterprises that we consider ‘transitional’ such as Father Nature. Earlier in the year we held a ‘Transition Livelihoods’ event which had been very well attended and generated a lot of enthusiasm. 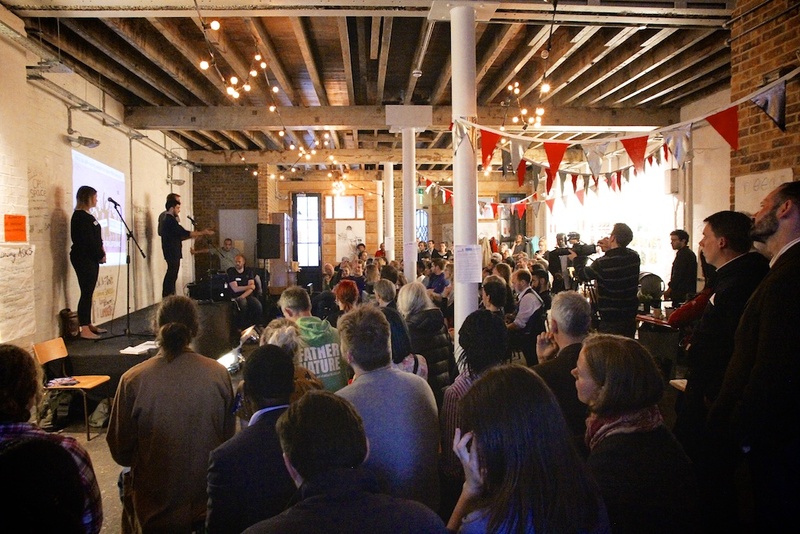 All of these warm up events, leading toward the first Lambeth Local Entrepreneur Forum, helped to gather together interested – and interesting – Transition Enterprises who might attend, and maybe even pitch, at the event. 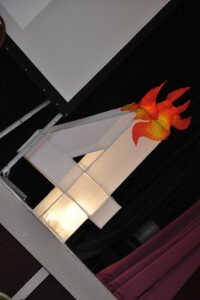 The LEF event was planned for early June and the results exceded our expectations. The shape of the day roughly followed the format developed in Totnes, but with a Brixton edge. 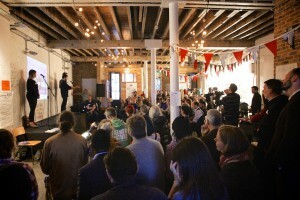 We started later in that day, had fewer speakers, and started serving locally brewed ale before dinner and pitching. 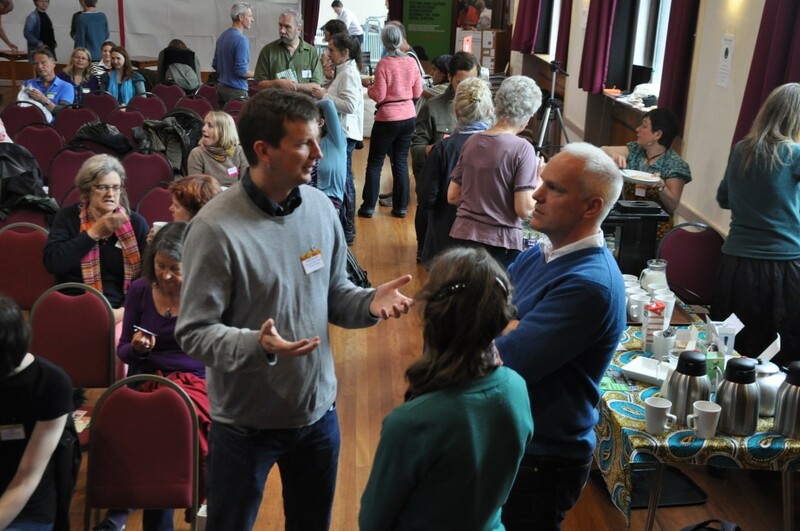 As with the Totnes format, the early part of the day included an open space session – ‘The Think Tank’. And like Totnes, one of the conversations that emerged and generated lots of interest was for a local bank in Lambeth. This has also led to subsequent meetings. There were other new conversations that were enabled by the LEF about how to make further progress in remaking the local economy in this part of London. It felt like something new and excited, and that including a strong core of community members, was launched. The other aspect of the Lambeth LEF was supporting local enterprises. 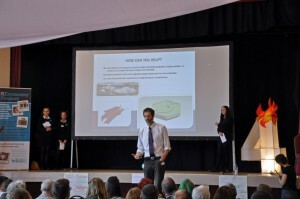 The Community of Dragons session generated lots of practical support for the 5 projects pitching – thousands of pound of financial and non-financial support – and created a warm feeling of generosity and solidarity. The pitching enterprises were: The Kitchen Table Projects, The Grain Grocer, The Library of Things, Spiral, and The Remakery, all of which came away happy. The efforts to organise and launch the first Lambeth LEF, including the warm up events and the network of suppport we have put together, have set the stage for more local action on the economy, here. There’s lots to follow up on and already we’re planning for the next one in 2016. 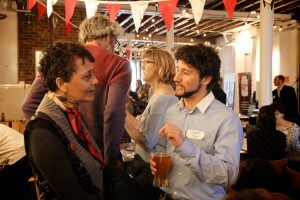 Blog authors: Duncan Law, Lambeth REconomy Project and Jay Tompt, Totes REconomy Project.